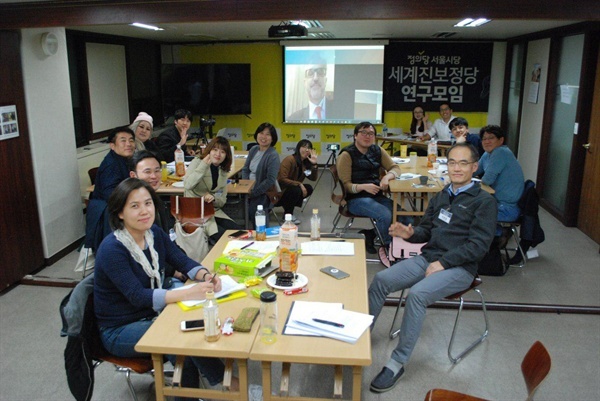 International Strategy Center and the World Progressive Parties Research Meeting of the Seoul Branch of the Justice Party held a teleconference with Five Star Movement Deputy Pino Cabras . How does the M5S create spaces of participatory democracy? The participation of citizens in public management and political dynamics is one of the fundamental pillars of the 5-Stars Movement. Since the beginning, our goal has been to bring citizens into institutions as well as to bring institutions closer to citizens. We can state that our online platform “Rousseau” has made history. Today, as we are in government, we are putting forward an important initiative aimed at encouraging active participation of citizens in decision-making process, namely the introduction of the proactive referendum without quorum, the main instrument of direct democracy. The proactive referendum is not in contrast with the principles of representative democracy. On the contrary, it provides Parliament with a key role: based on the Swiss model, the citizens’ proposal may be followed by a further parliamentary “counter-proposal”. If the promoter committee deems the latter satisfactory, the referendum does not even take place. Therefore, such a tool dynamises the political-institutional debate, demonstrating that direct democracy and representative democracy complement each other. How does the party deal with internal opposing viewpoints? We have a vibrant internal debate, at all levels, due to the differents ideological origins of many activists, but we are quite firm in establishing that the main votes of the M5S in the parliament must take place with discipline. During the last parliamentary term a fifth of parliamentarians was expelled, not for ideological dissent, but for not respecting certain rules: for example they did not pay half the parliamentary salary to the fund on micro-credit. This rule is now respected. In my constituency, I participate to frequent local meetings in which it is normal to receive both approval and criticism. It is very strong the influence of the communication structure, that is effective in coordinating the style, the volume and the calibre of the messages to be transmitted, as a coordinated image of M5S. How can members and affiliated social movements keep elected officials accountable? The Rousseau platform is undoubtedly the tool through which our Spokespersons respond for their actions towards registered citizens. On Rousseau, all the official acts by our Spokespersons are available and members are able to direct and check their activities. Some argue that direct democracy is a way of removing public administrators’ responsibility. This is not the case. If anything, it is a way through which citizens are involved and encouraged to be active and aware. The possibility of legislative intervention by citizens obliges the political class to have the common good as main objective rather than partisan interests. It is so much easier to achieve such a goal when citizens’ control is not limited to the elections time but rather when the control is extended to the decision-making process. How does the M5S gather information for its policy decision? How does it provide access to information so that people can participate in government? Let's take a concrete example: the debate on public works at the hands of the State on local communities’ territories. The current Code of Contracts already provides for a public debate that allows local communities to make comments on infrastructural works. Now we want such a provision to be effectively implemented. It is not just a question of encouraging citizen participation in decision-making process, but rather of allowing a fruitful debate capable of providing useful information from the widest spectrum of our society. Furthermore, such information also prevents the emergence of disputes after the public work started. It is more useful to discuss first with citizens instead of proceeding unilaterally and, then, stopping the public work in progress. Nowadays, the mean of the debate on public works must be enhanced, for example in terms of economic threshold of the single public work. It goes without saying that, even in this case, participatory democracy becomes an advantage for all the involved actors. One of the key elements of the M5S in expanding democracy is the internet. a) How does the M5S use technology to expand democracy? The active participation of citizens in decision-making process is in the DNA of the Movement. Today we urgently need to strengthen representative democracy, precisely through the direct democracy instruments. The goal is twofold: to ensure sovereignty as the people’s exclusive prerogative and to avoid any kind of interference on it. In this context, technology has so far played a decisive role and there is just no way around it in the future. For this reason, the Rousseau platform is expanding with unique and increasingly innovative features, if compared to the remaining political scene. When it comes to technology and networking, today we cannot ignore the blockchain technology, on whose development our government is focusing a lot of energy. b) The Justice Party also has a very active bulletin board where people can post their thoughts and opinions. Would you mind sharing some of the practices and policies of the platform Rousseau that make it effective and efficient at direct democracy? The Rousseau platform’s main features proceed on two tracks: on the one side, the management of the various elective components (Italian Parliament, EU Parliament, regional and municipal councils); on the other, the active participation of the members in the Movement's life. On “Rousseau”, registered members can propose a law, vote to select electoral lists or define the political stance of the Movement with respect to specific themes. Anyone can access Rousseau but only members of the Movement can actively participate. ”Lex Iscritti” is undoubtedly the most revolutionary function of “Rousseau” since it allows each member to propose laws to be brought into the Italian Parliament, in the European Parliament as well as in regional councils. In other sections, it is even possible to participate in the discussion on the drafting of the legislative proposals presented by the Movement's Spokesmen in the Parliament and in Regional Councils.